Who doesn’t love hot wings? Especially during football season when tailgating is king. 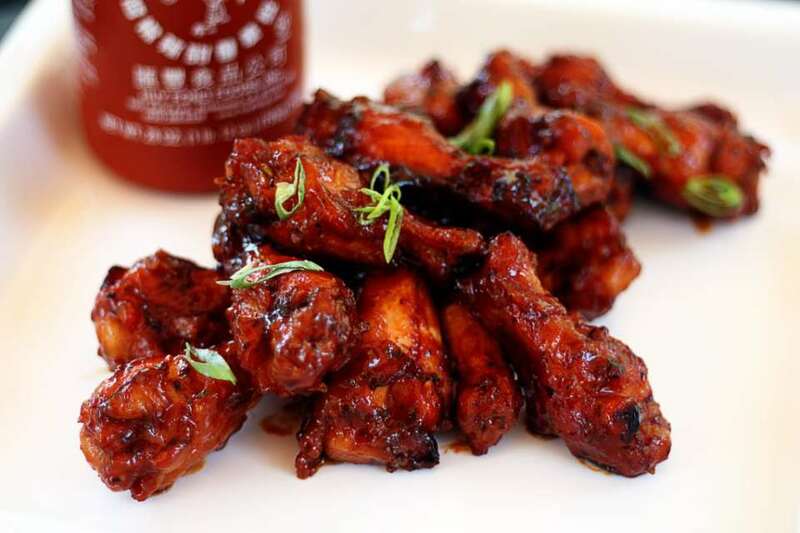 These Sweet and Spicy Sriracha Hot Wings are a twist on the classic Buffalo Style Hot Wings that are packed with intense flavor and will have your guests coming back for more! Sriracha is a Thai style hot sauce, also known as “rooster sauce” because of the rooster on the front of the bottle. It’s made from sun-ripened chili peppers, sugar, garlic, vinegar, and salt. 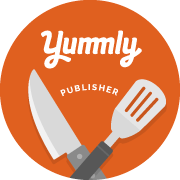 The familiar reddish orange bottle with the distinctive bright green bottle cap graces many culinary cabinets from chefs to the everyday home cook. It’s one of my favorite sauces to add to almost every meal, from scrambled eggs to sandwiches and popcorn. For these wings, I added a generous 1/2 cup of Sriracha to the marinade for a good amount of heat. After marrying with the other ingredients and caramelizing after cooking, it turned out to mellow the heat a bit. However, if you’re not one for a lot of heat, feel free to reduce the amount in the recipe or omit it and serve the Sriracha on the table as a dipping sauce. Place drummettes in a gallon size Ziploc bag. In a medium bowl whisk together all marinade ingredients. Pour over drummettes in bag. Press out most of the air and seal bag. Carefully toss drummettes with sauce in bag and place in refrigerator for several hours or overnight. Pour chicken and all of marinade into baking dish and bake for 45 minutes to 1 hour, stirring half-way through. *This can also be done on the grill or smoker. Keep an eye on it and watch for flare ups. Whisk into mayo for a powerful sandwich spread on roast beef, pork or poultry. Combine with ketchup and dip your tater tots. Drizzle over a slice of pizza to spice it up. Hot Salt (great on the rim of a margarita or on edamame): 1 T. Sriracha mixed with 1/4 c. kosher salt, dried. Add to raw ground meat when making burgers or sausage. Mix into melted butter and pour over popcorn. Blend into cream cheese on a bagel. Make meaner meatloaf by adding a couple tablespoons to the mix. Thanks to Pioneer Woman’s Tasty Kitchen for the feature! These wings look incredible. I’m going to make these over the weekend…awesome recipe. Thanks for sharing. Thanks Scott, I hope you enjoy! I’ve been ogling your porterhouse steak post – it looks amazing. Great photography too! These wings look awesome, I’m going to make them today. I was introduced to Sriracha when I moved to Maui in the late 90’s and have been using it like crazy every since. With your permission I’d like to post your recipe and my photos on my blog with a link to your recipe and cite you in the post, thanks.. Thank you for dropping by! Yes, feel free to post my recipe and link back to me. Let me know how they turn out!